When local musicians from the tiny Caribbean island of Trinidad created different notes on a discarded oil drum in the early 1930’s they could never have imagined the worldwide popularity and growth that was to follow. Now steel bands have sprung up in all continents, and in the UK there are many towns and cities with a set of steel pan instruments (steel drums) either in a school, as part of a community project or a steel band. CultureMix Arts is an organisation specialising in all aspects of steel pan music. • Instruments, from affordable starter sets to tailor made bespoke. • Accessories including stands, pan sticks, cases and storage solutions. • Tutors for workshops, demonstrations and presentations. • Tuners to help keep your instruments in tip top condition. • Training for those considering a creative career. • Steel Bands for your function or event. 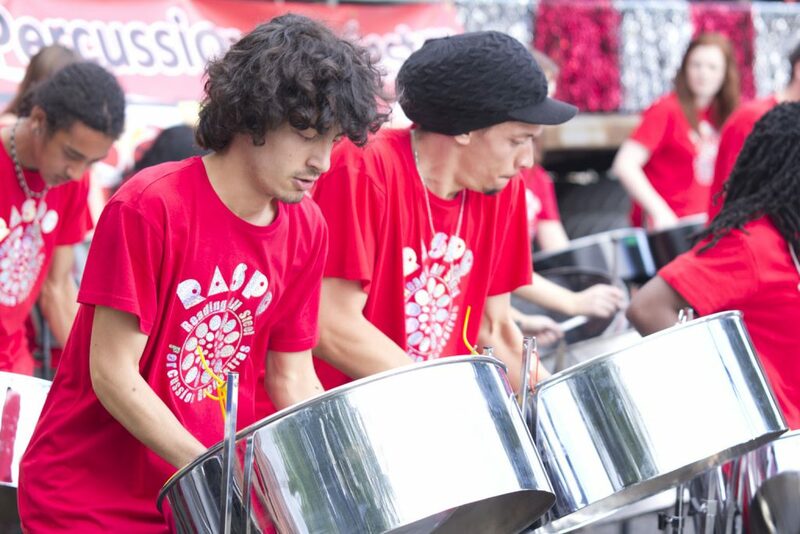 Our showcase orchestra RASPO, widely promotes steel pan music with it’s ensembles (steel bands) entertaining audiences at all types of events. But what makes steel pans so popular? In my experience the two reasons that stand out are its immediacy and accessibility. Similarly to a piano, a simple phrase on steel pan is quick and easy to learn. The steel pan instruments are welcoming and approachable for all age groups and abilities making it relatively easy to produce music that is satisfying to the player. What is a Steel Band? Chapter 1 - Steel bands come in a variety of shapes, sizes and combinations to convey the musical sounds of the Caribbean. This chapter explains the difference between steel bands, steel ensembles and steel percussion orchestras. Why set up a steel band? Chapter 2 - Schools set up steel bands as an ideal group-learning activity enhancing cohesion and diversity. This chapter outlines the reasons and the benefits of setting up a steel band in your school. Chapter 3 - Find out about the range of steel pans, how many pans needed, what to expect from a starter set and where you can buy the best quality instruments for the most affordable prices. Chapter 4 - A practical step by step guide to setting up your own Steel Band, how to organise the project and create an engaging activity for everyone involved that is enriching and sustainable. CultureMix teach regularly in my school, they are simply inspirational, always enthusiastic and highly talented.